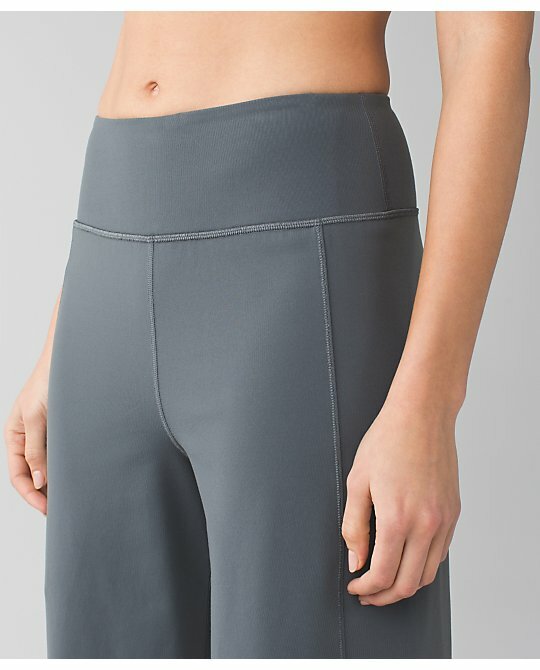 Anyone know what the About That Base LS and tights are made of? As a lover of onesies, even this one makes me go "wtf LLL" - it's a whole new level of nope. $198 for the karmic cocoon sweater?! Ouch. Guess I should be happy it doesn't come in a 2 because now I don't have to think about getting it. Oh my goodness, no. Just, no. Those pajama things have got to GO. That's horrible! What are we, four??? I'm very disappointed that the peacock think fast hoodie hasn't shown up yet in the US side. I actually looked at the upload and didn't realize it was the new one... I think everything is just starting to look the same to me. @3:53 pm -it's there on the US side. baaaaaaaaaaaaaaaaaahhhhaha the onesie. $178?! Who is spiking the coffee at LLL these days? Just... how did it get approved? wow! speechless I'm fairly new to LLL and have only a few items that I love (a couple of travel bags and jackets) can't understand the obsession... on the other hand I've been looking into other brands and I'm currently obsessed with Vimmia (cutest pants ever!) Teeki and Onzie, much much better quality and better designs. I don't see the red restless po either on US side ... I don't think it was uploaded for us. Did the U.S. ever get the striped scuba hoodie III? Or did I miss that one?? Thx! where is that restless pullover?? not on US side? and the new version of still pants? I don't see them either. Did all that upload to Canada only? 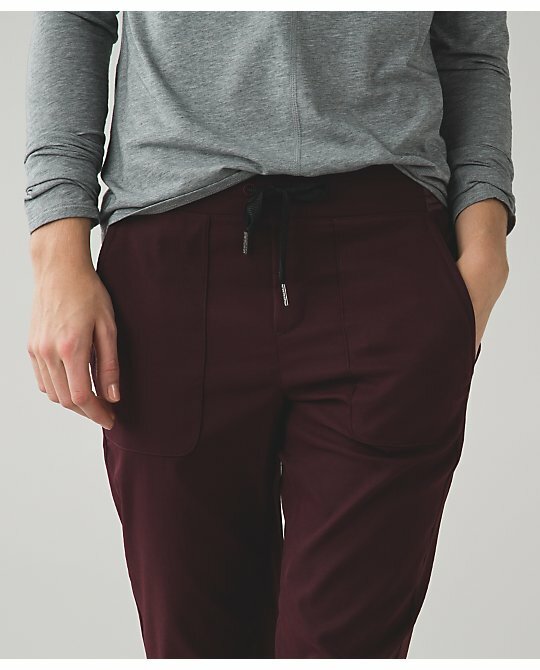 I have seen a lot of women with Onzie pants where the seam on the bum is pulling apart showing the threads. They aren't stitched like lulu. 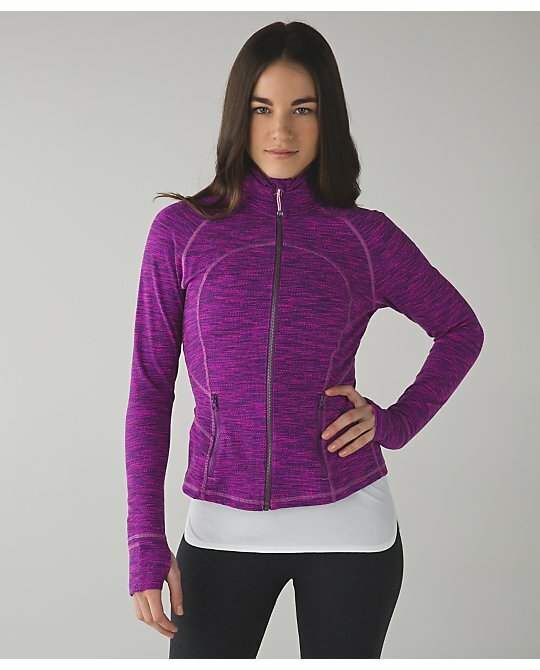 FWIW I've been a lulu fan for about 8 years with an extensive collection and yet to have any seam issues . They have it in Canada but it only goes to size 10. I tried another on in the store and they run a bit tight so I would want a 12. Strange the hoodie goes to 12 but the pullover doesn't. So tempted by the Karmic wrap, but I'm worried about spending so much on one piece that might pill (Brown Cow's comment strikes home to me). It's a gorgeous color, but ugh that price. I might grab the Jet Crop Slims, I don't know. I like those pace rivals but I'm afraid they would show a lot of sweat. I'm always suspicious of light to medium grays on that count. I think I'll get the Bleached Coral Swiftly (not sure if this is actually new?) and maybe the striped CRB. It's pretty cute. The onesie is so funny, although I could kind of see my teenaged daughter wearing it around the house. I was happy to see new colors in the What the Sport tee. Picked one up in Heathered black. Hoping we get the track tee colors that are out in Australia. @Anastasia - the Rest Less is only in Canada right now. @ anon 5:47 pm - I think a lot of people would like the onesie for jammies but not at $175. @ anon 4:49 pm - I think it's only in Canada right now. Onzie just copies designs. They had a blatant knockoff of the FTB wild and find the material for their pants very polyestery. 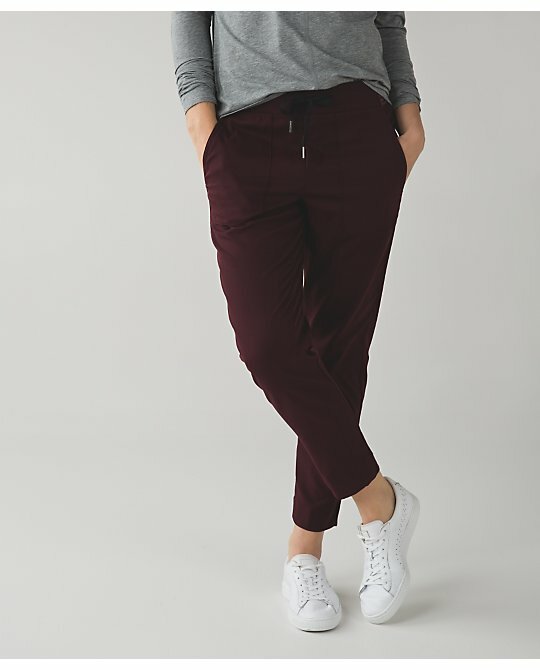 i'm gonna try the go trousers even though they're pricey. i have the black trouser that was the same price and i wear it all the time! $198 plus taxes on a sweater??? Lululemon is definitely insane! I guess if they are going down, they might as well go out with a bang?? 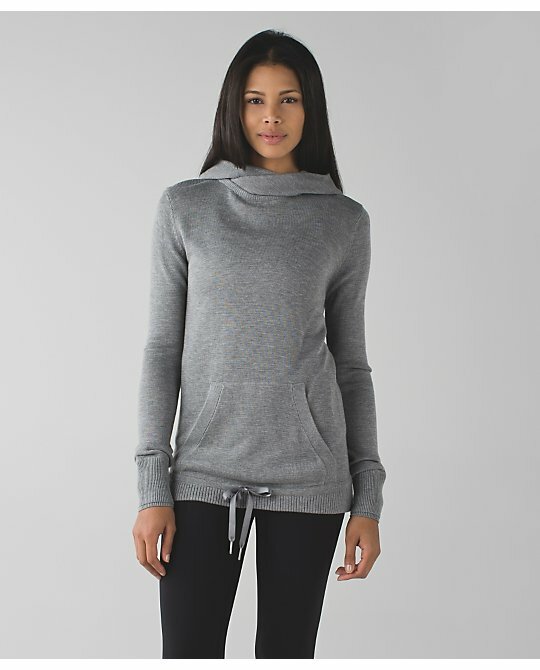 Also, if the cocoon wrap is anything like the hooded version of this I bought last year, $200 is actually worth it. It actually has a lot more weight than just a regular sweater. I use it as a jacket in Canadian winters and it's SO warm. Nice for those days you go out to the mall or something and don't want to wear your heavy winter jacket. My comment at 5:26 was about the berry rumble rest less. 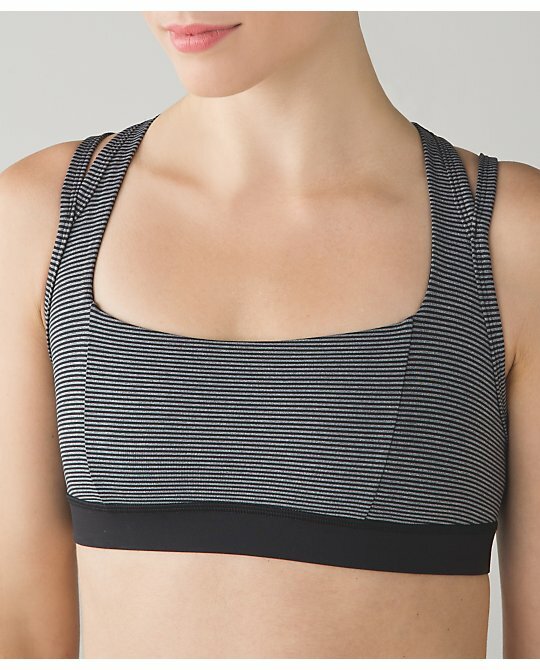 Plus it's winter here in Chicagoland abs with the mesh accents I just didn't think I'd be reaching for it.. It's a stretchy swift material better for warmer weather . I got the &Go dress in both the solid black and the black/white print in the store today. I just tried on the Here To There Dress that came out spring of '14?. I like the &Go better. Also got the Bleached Coral L/S Swiftly. 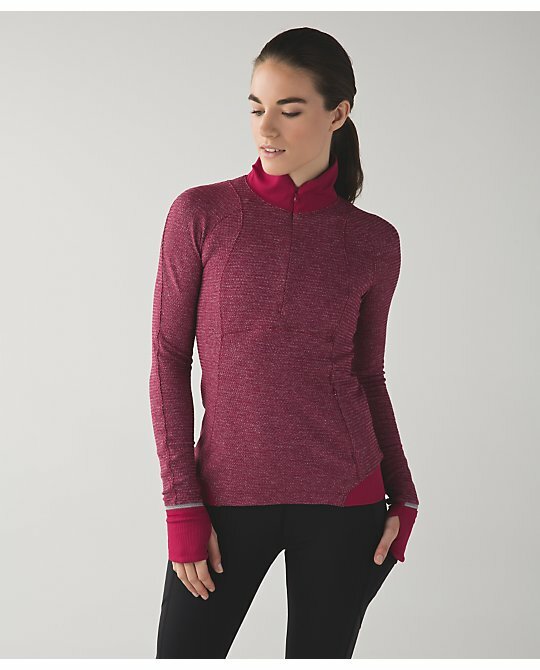 Earlier in the week...Sunshine Coast L/S and Down for a Run Vest in white. I see the Think Fast hoodie in the black with thin white stripe - the one with solid white trim many of us including myself poked fun at - sold out on line...sold out in my local store. Which of course makes me look at it in a different light for some dumb reason. 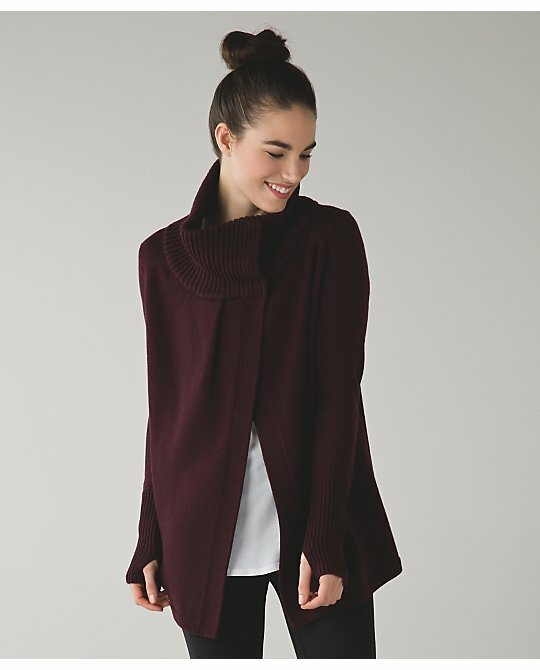 As for the Karmic Cocoon Wrap at $198, it's in part b/c it's Merino Wool which is softer and better quality than typical wool and it's a wrap, so it uses significantly more knitted material. If you look at something similar from Vince or Theory, you'll be looking at something in the high $200's I would think, if not higher. Of course you could also look at something similar, at less quality at Kohl's and maybe find it at $99. I think it's all relative to your competitive set. Love the silhouette of the til dawn dress but I was SO hoping for some more colors!! I don't need another stretchy LBD and both of the prints are SO ugly. That pixellated bordeaux? Wtf? Why not just do some nice solid colors? @5:09 - Most of my Lulu has seam issues. I'll have loose threads after usually just a few weeks of owning something. I ended up taking back and exchanging a pair of High Times after a year because they had three massive holes along the main seam along with pilling galore (every inch of those pants was fuzzy, even after I'd painstakingly removed the pills half a dozen times). And before anyone asks, I wash it all perfectly. At least with my Teeki leggings (that I got 35% off an already lower than Lulu price) when they eventually got a small hole my friend was able to very easily repair them in a couple minutes. That said, they stay up about as well as my new diamond jacquard high times, which is absolutely terribly. If I wanted my thong to show over my pants, I wouldn't be buying high rise. Rant over. Sorry @ anons 3:53, 4:27 - the Berry Rumble Rest Less was only uploaded to Canada. I got that mixed up with the Berry Rumble Runderful Half Zip which only the US got tonight. I'm really interested in the cozy buttercup jacket that Canada got, does anyone think the US will get that? I'm having a hard time swallowing the $240 price tag some Ebay sellers in Canada are trying to sell it for. Would really like the US to get it so I can try it on too. Does anyone know what the tank is that is shown under the onesie on the website? Luluaddict: !hanks for all you do. Was the slate herringbone Hustle in your Bustle uploaded. I'm a shorty at just under 5'3" so I think it will work for me. In any case, it's nice to know the jacquard one is well-made. Anon at 7:49 PM--I agree, if the sweater is as nice as the Merino's from last year then I'd justify it. I got a few as well, and they are awesome for travel. I wear them so much. They hold up so well. Would love to get your feedback on this one. I worry though because some of my Lulu from this year don't seem as well made but the prices have jumped so much. Some of the better merino's last year were at $150ish. 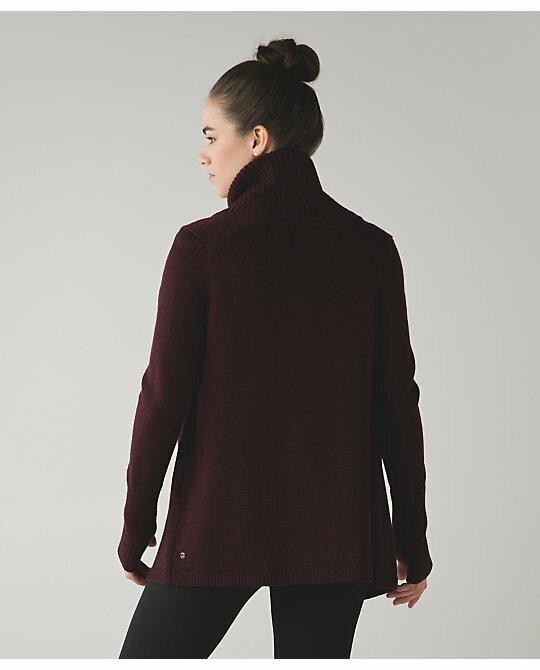 I bought the Karma Kurmasana in October at full price and it doesn't seem as well made as last year's sweaters. Blah upload-not even tempted by anything. Still waiting for the herringbone radiant jacket!!!! 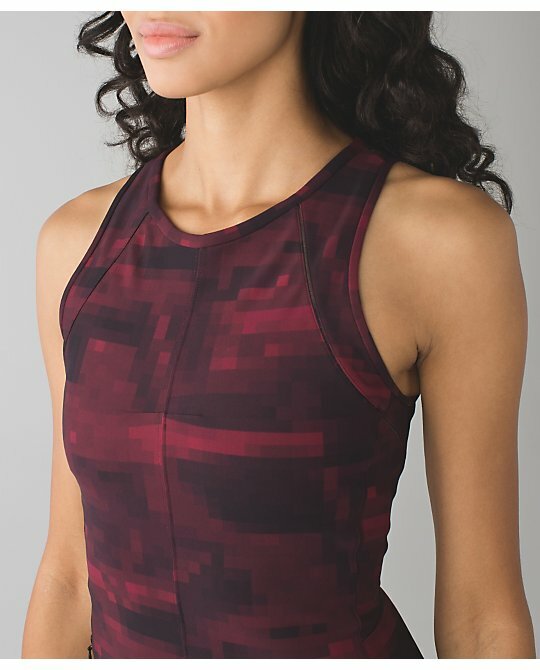 I adore the pixel print, I hope they get it in more colors and styles! I'm not a dress person. So cool to seem something nerdy and different! @ anon 4:35 am - I thought it was the Run Wild, too, but the back looks solid instead of made of lace mesh, but the lighting is such it's hard to tell. I would definitely be interested in a solid-backed Run Wild so I was hoping it was an upcoming style. @ anon 3:50 am - You're welcome! It was uploaded in Canada and is in Canadian stores now, too. I assume the US will get it shortly. @ summerilla - I don't know where it is. I know my store eds have been waiting for it, too. 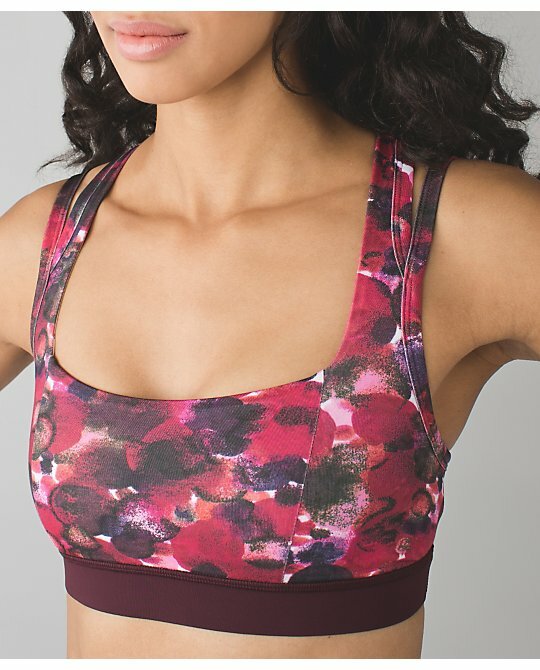 You would think it will hit the US eventually but lululemon has been so weird lately it's hard to tell. @kenny- I was wondering that myself. It looks like a knit so maybe it's coming. @kenny, @luluaddict...I think the knit tank is attached to the onsie. That was how I read it anyways. I purchased some wunder unders in herringbone print a few months ago and wore for the first time today. I can't say they are pilling but they are suddenly fuzzy everywhere, like as if they had angora or mohair in the fabric. Is this normal? Thinking of returning them! And super pissed as they were $100 ish. @ anon 12:05 pm - thanks! That'll teach me not to read the text. I got some coco pique wunder unders that did that too after like 2 wears.. They went so fuzzy. I sent them back but so sad because they looked so good. Now I'm hesitant to buy any of them from this years run. I'm confused on the onesie. I was thinking it would be good for someone who likes to sew, they could remove the shirt from the pants and have a new outfit! Then the tank top got thrown into the mix, and it seemed even better! However, since it's a knit, it probably wouldn't work that way and would unravel instead if you tried to separate them. Then, I started thinking of... so, if you have to use the restroom, you need to completely take off everything??? That shirt doesn't look easy to slip on and off (the arms are tight, there are buttons), but add in a tank top?? Is it attached? A tank top is tighter and you have to put it on and take it off over your head. You don't just split it and pull it down. How do you put it on/take it off? I drink a lot of water. I don't think the onesie would work for me at all. I love the onzie too would be so cozy!